Tribal towns have always been central to Mvskoke life. Before removal, people living in the Creek Nation distinguished between two types of community: tvlofv, a smaller settlement of households and their fields; and tvlwv, a larger network of families affiliated with a particular square ground and its fire. Each tvlwv encompassed various tvlofv, in much the same way that an Amish sect unifies scattered Amish settlements. One of the more prominent tribal towns in the old country was Okfuskee, an Upper Creek tvlwv on the Tallapoosa River. The site is now covered by a reservoir, but it’s safe to say that Okfuskee was organized around three essential public structures: town square, council house, and ball field. This central district was likely surrounded by private homes and gardens laid out in an orderly fashion, with a large communal farm on the outskirts of town. There were several Okfuskee villages nearby, in the Tallapoosa Valley, and several more on the Chattahoochee River, more than seventy miles overland to the east. 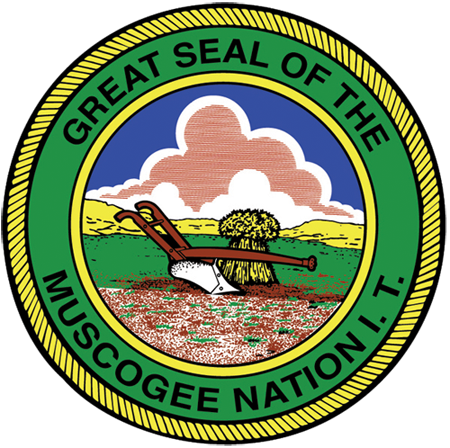 Like other towns in Mvskoke country, Okfuskee relied on cooperative agriculture. The town’s cropland was managed by one prominent leader, an official the English referred to as “master of the ground.” Among other duties, he directed the spring planting of the communal fields—and Okfuskee residents could be punished for failing to help. But few wanted to miss the singing, joking, and storytelling that made this vital work a festive experience. Other responsibilities for food production were assigned on the basis of gender. Women supplied fruits and vegetables from their household gardens, while men hunted game animals to provide meat for their families. Townspeople refrained from eating produce from the communal farm until posketv, known in English as Green Corn. And they could afford to do so, since the family plots were planted earlier and with a different variety of corn, one that ripened quicker. Okfuskee was hvthakv, a white town devoted to peace, and early interactions with the British were mostly peaceful. Mvskoke diplomacy was often signified with agricultural products given as natural tokens of goodwill: corn and watermelon seeds, dried tobacco, strings of barley corn beads. But relationships between town residents, between women and men, and between Okfuskee and the colonies began changing in the eighteenth century, especially during the years leading up to the American rebellion. Increasing trade led to economic dependence, so Mvskoke men started hunting deer for their skins rather than their meat. Imported livestock damaged crops, so Mvskoke women had to spend more time protecting the fields. Okfuskee grew more dispersed and townspeople altered their interactions with the land. The bonds of community welfare began to loosen just as settler aggression reared its ugly head. War, dispossession, and exile were just over the historical horizon. The Okfuskee name lives on today in several places: a ceremonial ground and a chartered community, both northwest of Okemah; a Baptist church, southeast of Eufaula; a county government, seated in Okemah; and a district of the Muscogee (Creek) Nation. But it’s been hard for tribal towns to practice collective farming since removing to Indian Territory, particularly after the allotment of Mvskoke lands a hundred years ago. Of course, this reflects a broader social trend away from local agriculture in the twentieth century, with fewer and fewer people directly involved in food production. In Okfuskee County, for example, the 2000 U.S. Census found that only 2.5% of the employed labor force was working in agricultural occupations. That’s a far cry from old Okfuskee, where every able-bodied citizen helped produce the community’s food supply. Perhaps the twenty-first century will bring a new era of home-grown farmers. We have a lot to learn from our Mvskoke ancestors.